Yes we block all the advertisements online, but there is one spam type that annoys us even more. It’s called referral spam and can be found on all our websites these days. Never heard of it? You probably have but are ignorant and saw the domains semalt.com, humanorightwatch.org, forum20.smailik.org and many other referral websites in your Google Analytics as legit referrals. Well guess what! This is a prank of some Russian called Popov A. Vitaly that is massively spamming the web with fake data in your Google Analytics. But don’t worry as we can help you block all the ads online we’re also able to remove the referral spam hitting on your websites. Referral spam is exactly what the name says it is. It pops up as a referral website in your Google Analytics Data and looks like another backlink. To bad because it isn’t a backlink that referrers potential new clients/visitors to your website. It’s a ghost visitor that leaves a digital footprint in your Google Analytics Account Data and yes it is SPAM! Therefore, we need to remove the referral spam and block those referrers on our websites. All the spam domains that Popov A. Vitaly use are abusing an open window in de Google Analytics UA-******** codes to mess up your data. No, referral spam isn’t harmful for your website or visitors. It does not install infected software, malware or leaves any crap behind. Nevertheless, it can be financially harmful because it leaves a digital footprint in your Google Analytics Data that is 100% useless. The referral spam visits that your website receives multiple times a day are useless because every visit is exactly 0,00 seconds and has a 100% bounce rate. This means that your beautiful website Analytics data is going to give a disturbed image of your actual traffic data. When you are trying to sell the website to a third party this isn’t going to help you since the stats are way lower than they actually are. The mastermind behind the spambot referral is Popov A Vitaly and claims to have created the spam websites and malicious spamcode for the fun, just to annoy us hard working people. The loose Internet Laws in Russia don’t forbid him in doing so which makes it even more annoying. But the real reason he created the referral spam is because of money. When you visit a spamdomain he redirects you to a webshop with his affiliate link, this way you receive the webshops cookie and Mr Vitaly is making money on that, lots of it. To some extend this practice is just another advertising channel for us to stop. In the end Google itself has to stop it by closing the window in the Google Analytics code. But this is going to be a difficult task since the spamdomains randomly generate infinite UA-******* codes until it hits your (randomly chosen) domain. Now lets move on to the solution on how to ban referral spam. Underneath you will find a list of referral spam website that we encountered in our Google Analytics Data. The list is updated daily and everybody is welcome to add a spam website if they find one. This will only benefit us all! There is also a new kind of referral spam making its way up. Namely the IP spam like this adress: 127.0.0.1:8888 which keeps sending useless referral traffic. You can block referrer spam in two ways. First, you can block the spam website in your Htaccess file with some simple code we provided below. Will this work? Yes and no, because the ghost visitor never actually visits your website. It only leaves a digital footprint in your Google Analytics data that messes everything up. The best way to remove the referral spam is to filter the spam website in your Google Analytics account. This way the referral data is blocked and filtered and you are left with clean GA web data. Nevertheless, doing both the Htaccess file block and Google Analytics filter won’t do any harm. Filtering the referral spam from your Google Analytics is the most efficient and effective way to create clean webdata. It is also the simplest solution if you don’t have any knowledge of Htaccess files. First go to your “Admin” tab in your Google Analytics account. You will see the main account column on the left with the option to choose “All Filters”. Choose this option and then push “+ New Filter”. 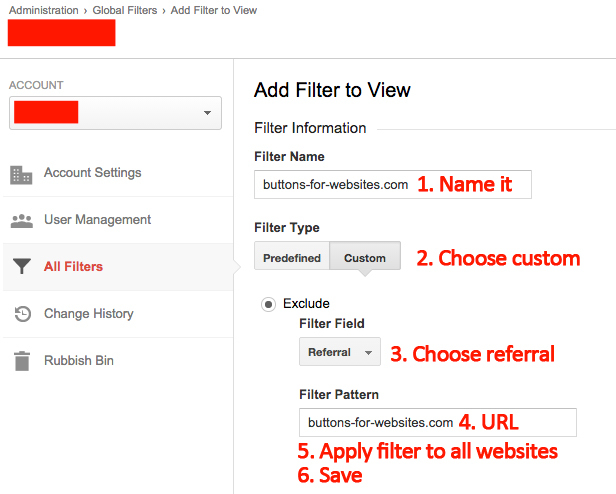 Give the filter the referral spamwebsites name, push custom and select in the dropdown “filter field” the option “Referral”. Enter the url without www. or http://, for example buttons-for-websites.com or 4webmasters.org in the “Filter Pattern” box. Apply the filter to all your websites in Google analytics and push “Save”. Viola you are done and referral spam free. Your Google Analytics data is no longer violated and polluted by spam created by a annoying person. Wan’t to know why Google isn’t blocking referral spam? We explained it here. Are you so annoyed by the Russian spam ip’s of Vitaly? Than here is also the option to filter a country. You will lose potential visitors from Russia but if your website is aimed at a local business it isn’t such a bad idea at all. To apply a total land filter you can go via Admin → All Filters → Custom → Country → Russia. Easy peasy and never ever receive Russian referral spam anymore. Have you found any new referral spamwebsites that aren’t in our spamlist please let us know! Sharing is caring and we will add it to our list so everybody can be referral spam free. This way we can take the joy out of it for Vitaly and other people that are infesting our web experience. The Dutch version of this referral spam guide can be found here. Special thanks to Raoul.io. How to block this referer spam? I need to protect my website.. Any simple plugin for wordpress? The best plugin I’ve found is GM Block Bots, I have it on all my sites. You still need to modify your .htacess file and if you care about Goggle Analytics setup filters. While the tutorial above on GA Filters is great, you need to be sure to verify each filter you set up within the filter (located toward the bottom). A lot of my filters now are set to “Campaign Source” and when I verify it shows how many it would have stopped in the last seven days. One of the other things I’ve done also is ban the IP address ranges of the spammers at the server level, use myip.ms to find the ip address ranges, this keeps them from being able to spam the comments. Stopping the referral hits on your GA stats will give you a much better idea of who and what people are viewing and reduce your bounce rate. Simple, easy-to-use, regularly updated, and easy to add your own referrers to the list. Also useful if you’re getting too many spammy backlinks. Plugins… sight! You found one? 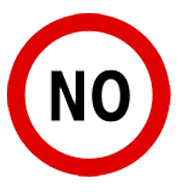 Ads-blocker.com is a voluntary initiatief of some Internet users that are fed up with all the online advertisements. Now we have a way to stop them all! Ad blockers that are showing ads, are you kidding? How to uncover subliminal advertising? Copyright © 2019 Ads Blocker.